On a rainy Spring afternoon in 1984, I had a life altering musical experience. I was a music major in my first year of college at Indiana State University. I know I've explained in this journal many times that I am a violinist, but I should also remind you that I also play the bass and the guitar. During my Junior year of high school, I started playing the acoustic bass in the jazz band which coincided with my exploration of the jazz repertoire. During college, I continued to play jazz while pursuing my classical violin studies. Most of my playing consisted of small jazz ensembles at school and outside gigs with local musicians at coffee shops etc. So on this Spring day, I was looking through the jazz collection and saw this record (See above). Wow....so cool. I mean...WAY cool, this dude with the trumpet and shades. I will confess that in hindsight, I am embarrassed that I had no idea who this dude was. I had only really started listening to jazz the year before during my Senior year of high school. During my Junior year, I only played the sheet music that the band director chose for the jazz band, and what little jazz I heard at that time was big band jazz. I had not yet been exposed to bebop or any other jazz. And still at the time, 99% of my music listening was devoted to classical music. So I take this record with the cool trumpet player on the cover and go to the listening stall at the end of the row which happens to be the one I like the most, and I cue up this album. For some reason, I am the only student in the listening lab at that moment. I lower the arm and the stylus makes contact with the vinyl. From the silence, a pop as the stylus finds the groove. Then I hear a piano playing A and G, followed by a saxophone playing a G, and then Miles on trumpet hitting a high D...muted and very close to the microphone. I had never heard anything like it. Sublime. It made the hair on the back of my neck stand up. I listened to this track over and over. It took me to a place I had never been before. I stared at the cover and wondered who this musical wizard was. 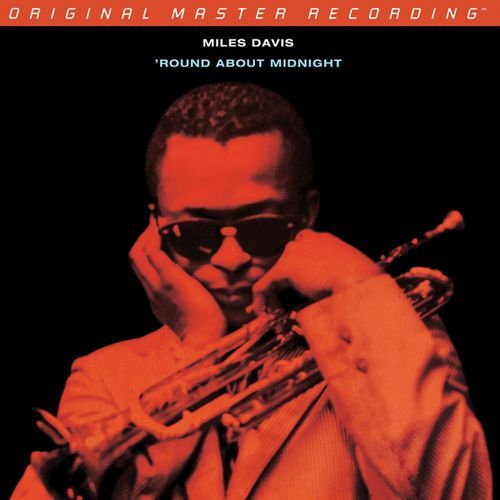 Miles didn't write Round Midnight....Thelonious Monk did in 1938. Many artists have recorded it. I think Miles' 1957 recording is the best. The Miles Davis Quintet consisted of Red Garland on piano, Philly Joe Jones on drums, Paul Chambers on bass and John Coltrane on tenor saxophone. From that moment forward, I listened to every Miles Davis record I could get a hold of. A new world had been opened up to me and I enjoyed exploring it. The following year, the Kronos Quartet came to the University to give a concert. Kronos is a string quartet that is best known for playing new and contemporary classical music. They were somewhat avant garde at the time and there was a big buzz surrounding their appearance on campus. I went to the concert and really enjoyed it. But it was their final number that stood out....Round Midnight. I have written fairly often in this journal about the fusion of musical styles and genres...the crossing of musical lines and such. This recording by Kronos certainly falls into that discussion. A truly classical ensemble playing a jazz standard. I think it works very well. The voices of violins, viola and cello offer a wonderful tone and flavor to this tried and true melody. P.S. As good as the Miles Davis album Round Midnight is, I did come to believe that the BEST Miles Davis album is in fact Kind of Blue from (1959). Check that out too.